"A ready to-bake piecrust and Sargento Shredded Reduced Sodium Mozzarella cheese make this a simply delicious meal." Unroll pie crust on baking sheet. Top with 1 cup cheese, leaving a 1-1/2 inch border around edges. Arrange tomatoes in a single layer over cheese. 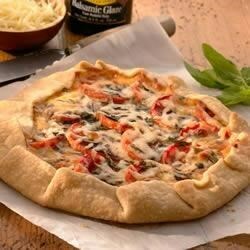 Drizzle balsamic glaze evenly over tomatoes; top with basil and the remaining cheese. Fold edges of pie crust over filling, tucking and pressing down edges onto tart. Bake on lowest oven rack in a preheated 375 degrees F oven 25 minutes or until golden brown. Let stand 15 minutes. Cut into wedges. Serve warm or at room temperature. Helpful Tips: Balsamic glaze is found with the balsamic vinegar in the supermarket, but if not available, simmer 1/2 cup balsamic vinegar until reduced to 2 tablespoons, 6 to 7 minutes. Cool completely. I've made this twice now. It's very good as written, but I've also tried it with the addition of a few sprinkles of EVOO. Both times a hit with the crowd. Be sure to use fresh basil. It was good but I would add less balsamic. I also added ricotta which I recommend. My wife makes this often and I don't think I could ever get sick of it. It's delicious and simple to make. Great snack for when you have guests over. This is a wonderful recipe! I have served it so many times the last two years for friends and family, and it always gets rave reviews and a request for the recipe ! And it looks pretty also. Delicious! I was out of pie crust so I used crescent roll dough. Rave reviews from the whole family, including the picky eater who doesn't like tomatoes. Will make again, often. Positively delicious and so easy to make. I should have made two as it went too quickly and nothing left for seconds. Great recipe.